Smoke Shack has been open for a few years, over on 332 N Milwaukee Street. I’ve been hoping to go for a while as I do love a good BBQ. When the chance to go for brunch came up with friends, I couldn’t resist. Looking at their menu, I realized they have a “house bloody” and a Bloody Jack made with Jack Daniels… fitting for a BBQ place, right? This time around, I opted for the ol’ stand-by but will certainly get the Bloody Jack next time. Mix: Across the board, this is a fantastic Bloody Mary. Created by the owners of AJ Bombers (and other locations in the Milwaukee area) I wasn’t sure if it would be identical to AJ Bombers. To be totally honest, I’d have to do a side-by-side taste test with AJ’s to make sure they’re not the same. What I do know is that I really like AJ Bombers Bloody. If they are the same mix, that makes sense… why change a good thing? The mix has such a great flavor. It’s a little spicy, a tad watery and a lot tasty. The mix didn’t give away distinctive spices but we all agreed on mustard – which I’m a huge fan of. I definitely recommend the Bloody Mary if you stop in. Garnish: The garnish was super simple, but super good. They had a pickled cucumber (where do we call it a pickle..?) that was SO good. Honestly, we discussed asking the server for more. I noticed that they pulled them out of mason jars as they were crafting the swizzle sticks so I assume they’re homemade. This also came with a block of cheese and a small slice of beef stick. Oh, and don’t forget that lemon and lime! Chaser: This did not come with a chaser. Cost: Sadly, I forgot to look at the price when our bill came around. The Bloody Jack is listed at $8.50 on the menu (regular isn’t listed). Knowing this, I think it’s safe to assume the regular is $8. Regardless of price, I think it’s well worth it. I’d really like to get back to Smoke Shack soon to try their BBQ. Close to our home is Milwaukee Smoke BBQ, which I highly recommend. My dad ingrained a never-ending quest for the best ribs. Smoke Shack fare runs out fast, though! For dinner hours, it’s basically first-come first-serve with the meat selections. I hope to try it soon! 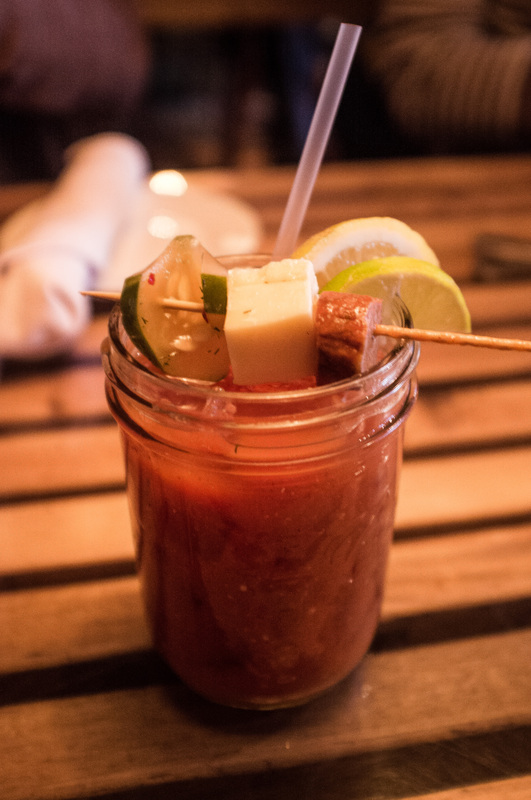 Growing more and more fonder of bloodies made with bourbon. Garnish looks impressive as well. Cheers! This entry was posted on February 8, 2014 by Shannon in Bloody Marys in the area and tagged Milwaukee, Smoke Shack, Third Ward.